First Lady Michelle Obama is visiting China for a week, with stops in Beijing and Chengdu. Michelle Obama is accompanied by her mother and two daughters, Malia and Sasha. Chinese First Lady Peng Liyuan will accompany her on part of her trip. In a blog, Michelle Obama said she would focus on “the power and importance of education”. Chinese media described the visit as “gentle diplomacy” and a chance to improve Sino-US ties. “A strengthened personal bond between the first families of China and the United States will naturally help generate better understanding and more common ground between Beijing and Washington,” a Xinhua news agency commentary read. Michelle Obama is expected to make stops at the Great Wall of China, the Forbidden City, the Terracotta Warriors Museum and the Chengdu Panda Base. The first lady will also meet students and will deliver a speech at the Stanford Centre at Peking University. The visit comes with a raft of issues testing China-US ties, such as the South China Sea dispute, Crimea and China’s relationship with North Korea. The White House has stressed that Michelle Obama’s trip will be “non-political”. She will focus on cultural exchange and avoid sensitive topics such as human rights and cyber security. “Her visit and its agenda send a message that the relationship between the United States and China is not just between leaders, it’s a relationship between peoples,” said Ben Rhodes, the deputy national security adviser for strategic communications, earlier this week. 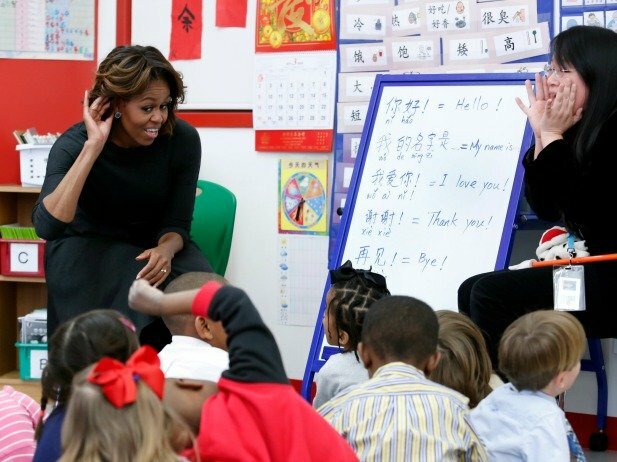 Michelle Obama’s visit has prompted discussion in Chinese media.